A core belief of Dwolla is that We believe the best teams are built by the inclusion of diverse ideas, experiences and people. We believe in linking our words, with actions. In May, Dwolla dedicated nearly three days for the team to focus on a diversity and inclusion-themed hackathon. 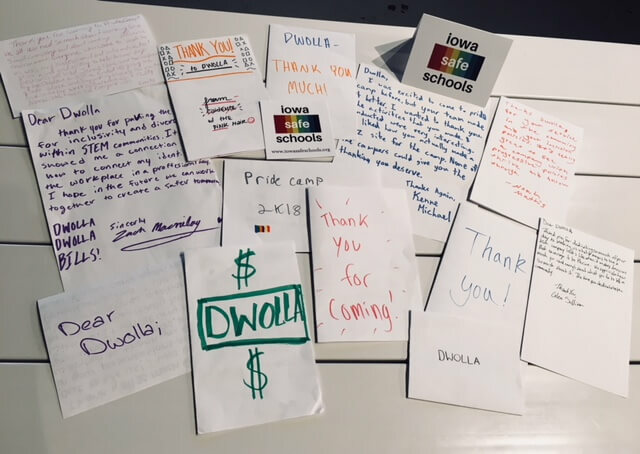 Becky Smith, the Gay Straight Alliance Network Coordinator for Iowa Safe Schools, said other than Pride Month—which is June—there isn’t a lot happening that embraces and encourages students to do more in the LGBTQ community. After a brainstorming session with the leadership of Iowa Safe Schools last June, Smith said they decided to step out of their comfort zone and host a summer camp. The three day Pride Camp was June 12-14 and brought over 30 high school students to Grand View University. Smith said the activities took place all around the campus, students who stayed overnight slept in the dorms and meals were fed in Grand View’s new dining hall. “All of our events are not just sit and get events, we wanted to make sure everyone is engaged,” Smith explained. To highlight this, Smith said she reached out to Dwolla. Dwolla’s Lead Software Engineer Nick Leeper and Jenna Hogan, Dwolla’s Director of Human Resources, responded. Smith said she expected the Dwolla team to do an hour panel discussion. “We thought maybe they come and do an hour long thing…they did almost a half day,” Smith said laughing. Leeper says the panel discussion was an opportunity for the 12 Dwolla employees to talk about how they got into technology and what they looked for in a company during their career. Smith said a student asked the best way to ask a future employer where they stand on LGBTQ issues. Leeper said Pride Camp provided Dwolla with a chance to take a leadership role within the Des Moines community. Smith said Pride Camp is already scheduled for the 2019 summer. Iowa Safe Schools will organize a week-long camp from July 15-19. Visit pridecamp.org for more details.